BASF today broke ground on a $50+ million facility in Elyria, Ohio, to produce advanced cathode materials for lithium-ion batteries that will power the hybrid and full-electric vehicles of the near future. The event attracted a number of federal, state and local officials, as well as representatives of the U.S. Department of Energy (DOE), its affiliated Argonne National Laboratory, and numerous BASF employees from Ohio and other parts of the company's global manufacturing and research and development operations. "This new facility will put BASF and the state of Ohio at the leading edge of the North American cathode materials market," said Frank Bozich, President of BASF's Catalysts division and member of BASF Corporation's North American Executive Committee. "As the world's leading chemical company, BASF has the ability to make advanced cathode materials widely available as next generation lithium-ion battery production begins to ramp up in facilities throughout the country." The new BASF production facility in Elyria is being built with the help of a $24.6 million grant from the DOE under the American Recovery and Reinvestment Act. BASF is one of only two licensed suppliers of the Argonne National Laboratory's (ANL) patented Nickel-Cobalt-Manganese (NCM) cathode materials, which employ a unique combination of lithium and manganese-rich mixed metal oxides. The license covers the broadest scope of NCM chemistry that can be used in today's lithium-ion batteries. When it is fully operational in 2012, the BASF plant is expected to be the most advanced cathode materials production plant in North America. 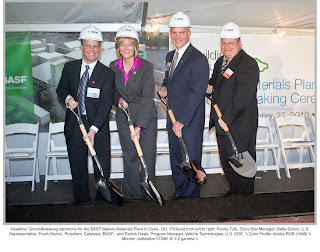 "By building this lithium-ion battery materials production facility in Elyria, we will create both construction jobs in the near term and good-paying, cutting-edge jobs to strengthen our future," said Representative Betty Sutton, who worked with BASF to help bring the new facility to Lorain County. "Today, we are demonstrating that manufacturing is not just part of our past, but also an important part of our future, positioning Lorain County as a global leader in this clean energy technology." "Today's event is another tangible sign of Ohio's commitment to green energy," said Ohio State Senator Sue Morano (13th Ohio Senate District). "I am a strong supporter of reshaping our manufacturing base into one that is well positioned for the future, and operations like BASF's new battery materials plant will help attract better paying jobs to Lorain County and Ohio as we play a key role in the development of a green economy." Since 2005, BASF has invested significantly in lithium-ion cathode materials research and development. In 2009, BASF and ANL signed a worldwide licensing agreement under which BASF would mass produce and market ANL's patented lithium-stabilized NCM cathode materials for use in advanced batteries that have higher energy density, are longer-lasting, and offer improved safety due to higher temperature stability. As part of its long-term strategy to invest in cathode materials, BASF will continue to further lithium-ion battery application development at its research facilities in Beachwood, Ohio, and Ludwigshafen, Germany.